So wrote Jane Austen, or she would have, I think, if she were chronicling our current age (instead we have Taylor Lorenz, and thank goodness for that). I begin with these two observations of human nature because few would dispute them, yet I seldom see social networks, some of the largest and fastest-growing companies in the history of the world, analyzed on the dimension of status or social capital. It’s in part a measurement issue. Numbers lend an air of legitimacy and credibility. We have longstanding ways to denominate and measure financial capital and its flows. Entire websites, sections of newspapers, and a ton of institutions report with precision on the prices and movements of money. We have no such methods for measuring the values and movement of social capital, at least not with anywhere near the accuracy or precision. The body of research feels both broad and yet meager. If we had better measures besides user counts, this piece and many others would be full of charts and graphs that added a sense of intellectual heft to the analysis. There would be some annual presentation called the State of Social akin to Meeker’s Internet Trends Report, or perhaps it would be a fifty page sub-section of her annual report. Despite this, most of the social media networks we study generate much more social capital than actual financial capital, especially in their early stages; almost all such companies have internalized one of the popular truisms of Silicon Valley, that in the early days, companies should postpone revenue generation in favor of rapid network scaling. Social capital has much to say about why social networks lose heat, stall out, and sometimes disappear altogether. And, while we may not be able to quantify social capital, as highly attuned social creatures, we can feel it. Social capital is, in many ways, a leading indicator of financial capital, and so its nature bears greater scrutiny. Not only is it good investment or business practice, but analyzing social capital dynamics can help to explain all sorts of online behavior that would otherwise seem irrational. 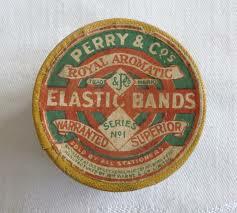 As we contemplate our craving, we might recall that it was on this date in 1845 that a method for manufacturing elastic (rubber) bands was patented in Britain by Stephen Perry and and Thomas Barnabas Daft of London (G.B. No. 13880/1845). In the early 19th century, sailors had brought home items made by Central and South American natives from the sap of rubber trees, including footwear, garments and bottles. Around 1820, a Londoner named Thomas Hancock sliced up one of the bottles to create garters and waistbands. By 1843, he had secured patent rights from Charles Macintosh for vulcanized India rubber. (Vulcanization made rubber stable and retain its elasticity.) Stephen Perry, owner of Messrs Perry and Co,. patented the use of India rubber for use as springs in bands, belts, etc., and (with Daft) also the manufacture of elastic bands by slicing suitable sizes of vulcanized India rubber tube. The bands were lightly scented to mask the smell of the treated rubber.